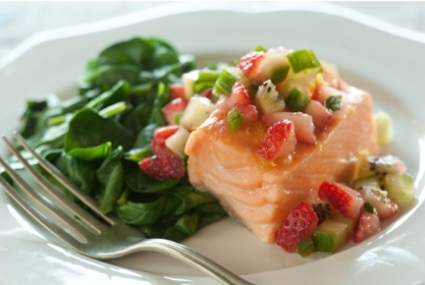 Baked Salmon with Strawberries! Yummy! It might seem a strange combination at first, but you will see that the salmon taste goes perfectly with the sweet fruity berry-taste. The picture was kindly provided by Whole Foods Market. They are generous enough to allow me to share some of their recipes and pictures with you. I cannot speak highly enough of them. By the way I don't get anything for promoting them, but I really really like their values and company culture. This recipe is going to knock your socks off! 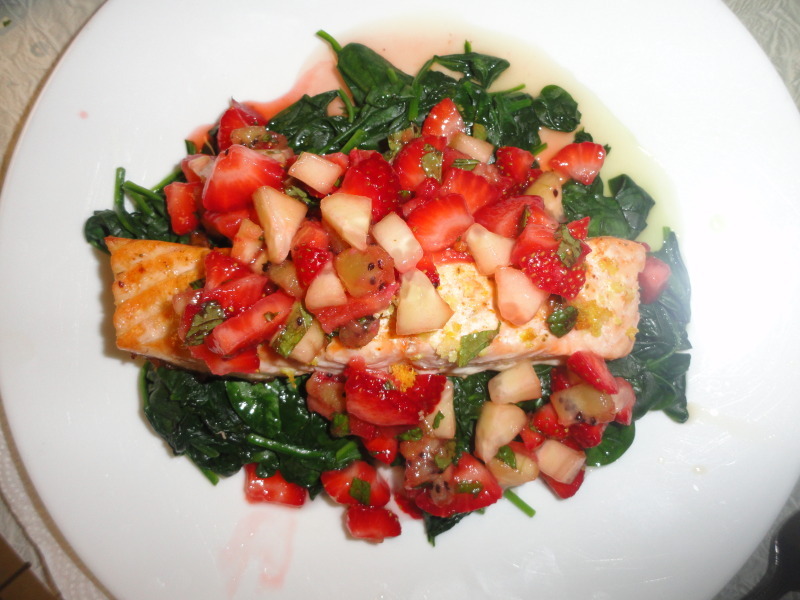 If you're not interested in the nutritional values of this salmon strawberry recipe, skip down to the next headline. Strawberries have plenty of health benefits, that's why you like them, right ? (Just kidding) Read more here. Salmon is an excellent source of quality protein and rich in Omega 3 fatty acids, which help your body function optimally. Lean sources of protein like Salmon are an excellent example of a high energy food that also assists weight loss. Read more in the free fish oil guide. Great flavor? You got it! Picture above and recipe kindly provided by Whole Foods Market. Cover tray with baking sheet and place salmon on top. Sprinkle throughly with lemon zest. Put diced strawberries, kiwi, cucumber, jalapeño, mint and 1 tablespoon lemon juice in a medium bowl and toss until combined. Set aside. Heat a large, high-sided skillet over medium heat. Add spinach, with water still clinging to leaves, cover and cook 5 minutes or until wilted, stirring occasionally. Stir in remaining lemon juice. Divide spinach among plates. This is ideal if you are on a gluten-free or dairy-free diet.